Orange-fleshed sweet potato (OFSP) is one of the most well-known interventions linking agriculture and nutrition. The purpose of this session is to explain why that is: not necessarily because it is the best intervention, but because it has been carried out extremely well, from delivery to evaluation. 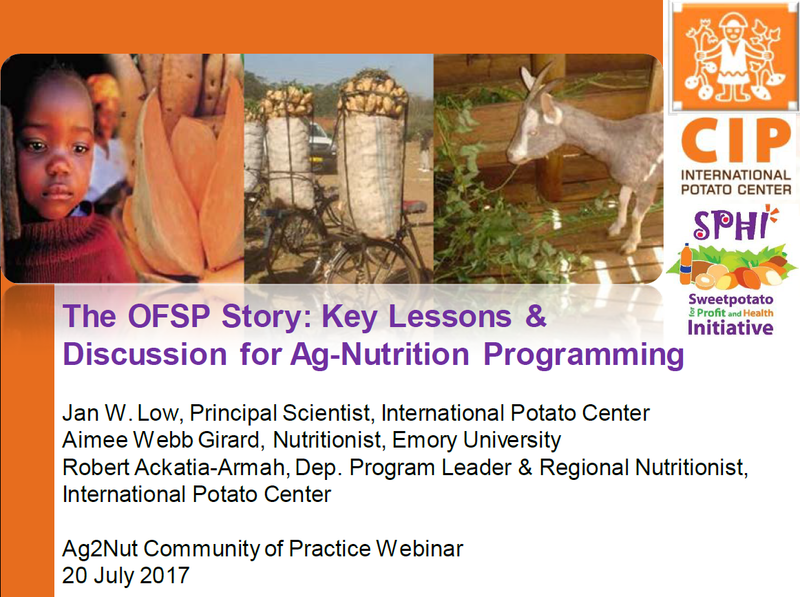 In this hour, we heard from researchers who have driven OFSP programs and research in Africa: Jan Low, co-recipient of the 2016 World Food Prize for work on OFSP (along with Maria Andrade, Robert Mwanga, and Howdy Bouis), Robert Ackatia-Armah, and Amy Webb-Girard. They share reflections on the OFSP work and what ingredients made it so successful, as well as recent results and insights on the latest work evaluating the integration of OSP into ante-natal care services for pregnant women.